A picture speaks a thousand words department: here’s a sampler of images from the second annual International Cookbook Fair, held at Le 104, a skilfully restored, century-old complex of buildings in the 19th arrondissement on central Paris’s northeastern edge. Nowadays a trendy cultural center and beacon in an edgy part of town, it’s best not to ask what the buildings were designed for (see the end of this post). The cookbook fair draws participants from dozens of countries, with hundreds of cookbooks and other food books submitted by publishers. Dozens and dozens of awards are made. This reflects the global nature of the venture and not merely an effort to ingratiate the fair with many publishers worldwide, as some cynics were heard to quip during a visit today by your correspondent. That’s me, undercover at the fair’s restaurant, afraid I might be recognized by one of the organizers as the author of Food Wine Burgundy. Unbeknownst to me the book was on display, and presumably had been entered in the competition. It must have been one of the few titles to not win an award. I quipped in my usual good-natured way, in the spirit of Mark Twain, about this curious fact to the pair of young ladies in charge of the Wine section. They did not get the joke in English, French or Italian. Why Italian? Italy was the country of honor this year, and I mistakenly thought they, like me, were at least part Italian and might speak the lingo of Dante and know the definition of irony. Funnily, humor and irony did not appear to feature high among participants or those officiating, though my sampling was admittedly not scientific. While Italy was the guest of honor, China seemed ubiquitous. 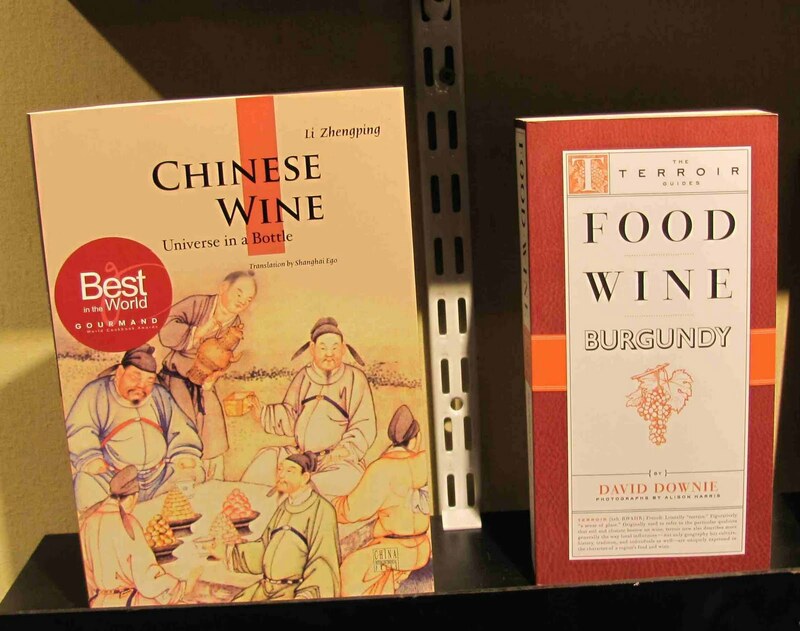 The same cynics who grumbled about other imperfections at this, the best of all possible cookbook fairs, was heard to remark that the head organizer of same lives part of the year in Beijing, and produces shows for China Food TV. Since he makes no bones about what he does, and since China is a great country for culinary traditions, the spotlight on China must be applauded, and that’s the end of that. The highlight of our visit was lunch at the fair’s restaurant. Stylish, packed with all ages and voice volumes, all talking and shouting at once in a babel of lithe tongues, the eatery featured a short menu with cooking by stellar chef Fabrice Biasiolo (of Une Auberge en Gascogne, Cochon, Canard et Cie etc.). The chunky chunks of pork jowl served atop a pile of mashers were offset by sun-dried tomatoes, not exactly ethereal and certainly not in need of the abundant olive oil pooling around, but tender, flavorful and delicious. Because of the shape of the serving bowl I was unable to lick it gracefully, but would have if I could have. The risotto with cuttlefish ink was perfectly cooked, despite the vast number of eaters ordering it. Why it was topped with arugula, pancetta chips and shaved Parmigiano is anyone’s guess. But you know the answer: More is More these days. Finished are pure flavors, simplicity, humility & company. They are simply not ludique (for an explanation, see my story for Gadling about Paris’s food scene). Speaking of which, I was tickled to see lots of Big Books by Big Chefs, les grands chefs des grands restaurants, qua. It’s only fitting that the biggest of all were by (and perhaps for) Monsieur Alain Ducasse. Since most food lovers and all chefs are used to hefting weighty pots, they probably don’t mind the heft and weight of these giant volumes. More is definitely not less these days. I could go on, and will, to add that it was refreshing to see Le Monde‘s restaurant critic Jean-Claude Ribaut quoted on the need for courageous, counter-current, constructive criticism in the restaurant world. In my view, Ribaut’s maxim applies to the entire food universe, where earnestness, narcissism, joyless solemnity and hollow hedonism lurk at every turn, a motley, unlikely rogues’ gallery equipped with very sharp knives. So, in the spirit of Twain and Ribaut, I dare to opine that the cookbook fair was a great success; the organizers deserve hearty handshakes, congratulations, and extra rations of mashers with sun-dried tomatoes. A pinch of constructive criticism, counter-current humor and ribald mirth wouldn’t hurt, either, but this isn’t the place to administer them. Now I can reveal what Le 104 was built to be: the city’s morgue, and a coffin factory! No wonder it was chilly and, at times, cheerless! I am looking forward to next year’s fair. And I will be sure to come incognito.